attached to three phosphates (I Figure 12.7a). In DNA synthesis, nucleotides are added to the 3'-OH group of the growing nucleotide strand (IFigure 12.7b). The 3'-OH group of the last nucleotide on the strand attacks the 5'-phosphate group of the incoming dNTP. 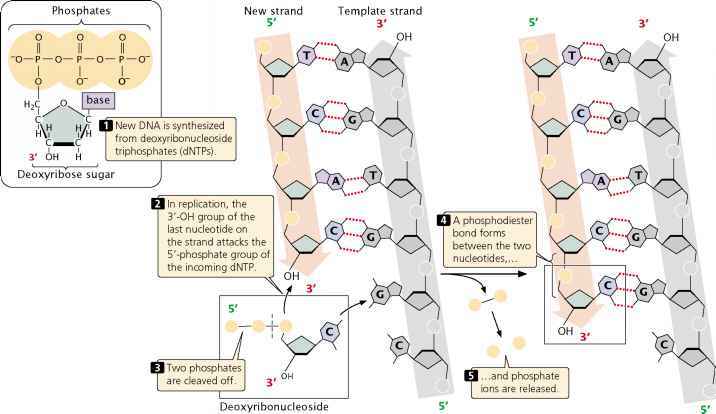 Two phosphates are cleaved from the incoming dNTP, and a phosphodiester bond is created between the two nucleotides.